Agilent Technologies Inc. (NYSE: A) recently introduced the U5340A FPGA development kit, powered by a custom Mentor Graphics design engine, for high-speed digitizers. The U5340A enables customers to deploy advanced real-time signal processing into the FPGAs on board Agilent high-speed digitizers. The development kit leverages the full density and speed of the FPGA while ensuring the digitizer's outstanding multi-gigasample-per-second performance. The FPGA development kit enables original equipment manufacturers and researchers to easily design in high-speed signal acquisition and analysis. This software tool can help companies and research institutions protect their intellectual property and shorten time-to-market as they develop technologies for high-end applications such as medical imaging, environmental monitoring, time-of-flight spectroscopy and radar. The custom Mentor Graphics design engine-including HDL Author, ModelSim PE and Precision Synthesis-is embedded in the development kit to support the design, synthesis, simulation and validation of signal-processing algorithms. Place-and-route and a bitfile-generation engines are included, also providing debugging capabilities. To help users focus on creating solutions, the FPGA development kit also includes the following elements: a library of building blocks, from basic gates to dual-port RAM memories; a set of IP cores; and ready-to-use scripts that handle all aspects of the automated build flow. A full-speed design example and companion software ensure efficient system integration. All cores are based on the AMBA AXI4 standard for easy integration and efficient use of their high-performance capabilities. Pre-synthesized and area-constrained IP cores accelerate the build and ensure repeatable results. The FPGA development kit also embeds complete calibration capabilities to ensure the unmatched analog performance of Agilent digitizers when used with end-user firmware. "Agilent has been a long-time Mentor Graphics customer and has helped shape our FPGA development tools over the years," said Valerie Rachko, marketing director for Mentor HDL and ESL design creation tools. 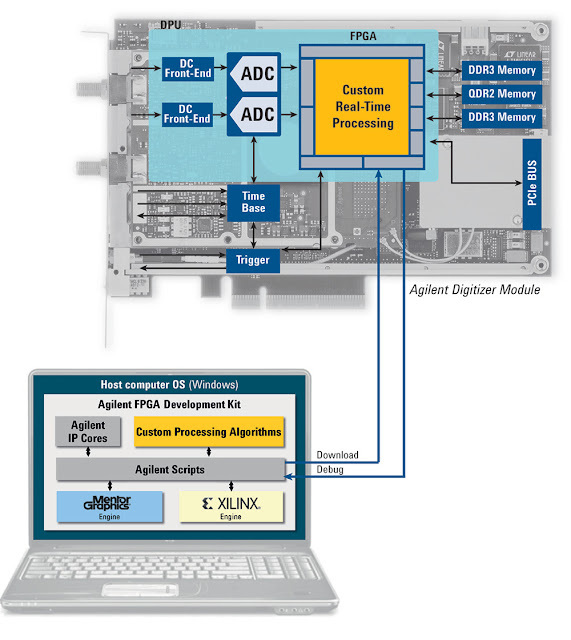 "It was a natural choice for Agilent to select our creation, simulation and synthesis solutions for their customers in their new FPGA development kit." "Our close partnership with Mentor Graphics enabled us to create today's most powerful FPGA development kit for high-speed digitizers," said Didier Lavanchy, operation manager for Agilent's high-speed digitizers group. "We have used the kit to design firmware options currently available in our products, and beta customers have successfully implemented a variety of algorithms. For them and us, the U5340A has significantly reduced development time and, for the first time, made possible multi-gigasample-per-second real-time processing." The first release of the U5340A FPGA development kit is available now for the recently announced Agilent U5303A PCIe 12-bit high-speed digitizer with on-board processing, and will be available for future products. Interested users can contact Agilent to discuss their application needs, evaluation possibilities and custom quotes at digitizers@agilent.com. More information on the U5340A is available at www.agilent.com/find/u5340a. Screen shots of the FPGA development kit are available at www.agilent.com/find/u5340a_images. Agilent high-speed digitizers are the result of 300-plus years of cumulative research and development. This ensures the ability to achieve the most effective and reliable analog-to-digital conversion at high resolution and fast sampling rates. Information on ADC technology and applications is available at high-speed-digitizer.tm.agilent.com. Mentor Graphics is a leader in electronic design automation software, enabling companies to develop better electronic products faster and more cost-effectively. Mentor Graphics' innovative products and solutions help engineers conquer design challenges in the increasingly complex worlds of board and chip design. Information about Mentor Graphics is available at www.mentor.com.